After enjoying the savory and spicy Korean cuisine at Yoogane in Il Terrazzo, we can't help but notice a fairly new stall of sweet treats just beside the restaurant. It was the first time I've seen Gavino's Japanese Donuts, but I've already had a ton of them as of late. Apparently, Gavino's Japanese Donuts started out in Mercato Central over a year ago. This donut brand is the brainchild of husband-and-wife tandem Andrew and Michelle Que who can't get enough of the Japanese pon de ring donuts. If this is the first time you've heard about pon de ring, they're made of super soft and chewy balls interconnected to form a ring. 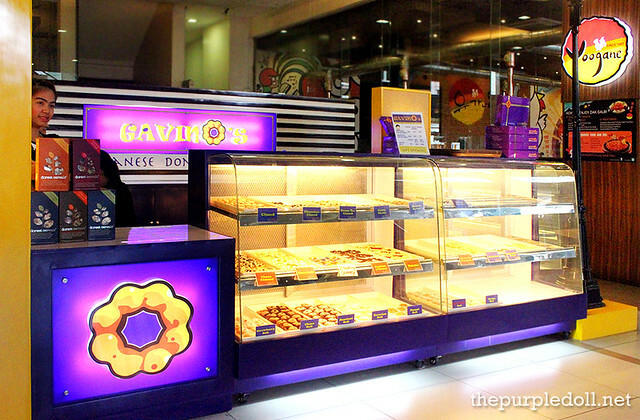 Gavino's Japanese Donuts has a flagship store in Greenhills Town Center along Granada Street, Quezon City where you can sit down and enjoy their offerings with a cup of their specialty beverage. But since I haven't been there yet, let me share my experience with these Japanese donuts from their stall at Il Terrazzo in Tomas Morato. 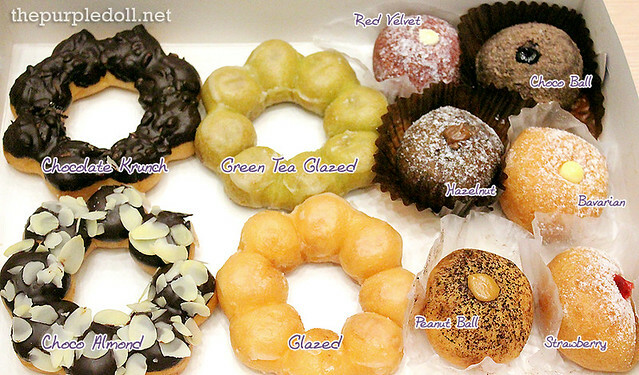 These are the donuts from my first box of Gavino's which had an assortment of their offerings. Aside from pon de rings, this Japanese donut brand also carries pon de balls which are as soft and as chewy as their ring counterparts. 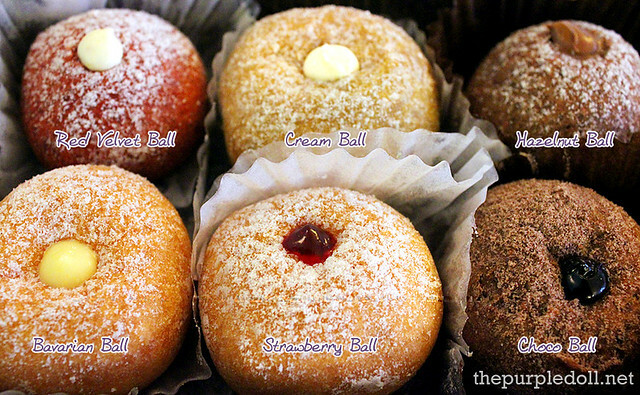 What makes these smaller balls of goodness special though is not just the fact that they don't form a ring, but rather, they have a creamy filling inside which is a sure hit with cream-filled donut lovers. As of the moment, I've already enjoyed a box of Gavino's assorted Japanese donuts, 2 boxes of pon de rings and a box of their pon de balls. 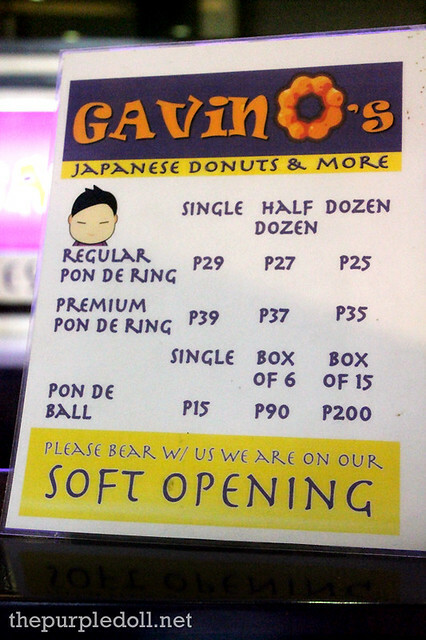 It may seem like too much as I discovered Gavino's Japanese Donuts just earlier this month. However, with addicting donuts and very affordable pricing, who wouldn't be tempted to take home a box or two? This is my first box of Gavino's Japanese Donuts which had not just me, but even my mom and my little sister hooked. I brought this home from Il Terrazzo, and in just under 10 minutes, this box was wiped out! While my sister munched on the Chocolate Krunch, Choco Almond, Choco Ball and Hazelnut Ball, my mom was busy gorging the rest of the pon de balls one after the other. I reserved the Green Tea Glazed for my dad, and I was glad he loved it. And since there was only a piece of the Glazed donut left, I saved it for myself. Even if I only got to try the most basic variant from Gavino's, I already got addicted! The donut was super soft, airy and chewy at the same time. It's also not too sweet so you can definitely eat more than a piece of this treat in one sitting. For our second box of Gavino's Japanese Donuts, you can already guess which ones were mine and which were my little sister's. Like our first experience with the pon de rings, every bite off these treats were magical. They were as soft as fluffy clouds, and we truly enjoyed every piece of the ring. From the box, it's suggested that the donuts be heated in the microwave for about 8 seconds. But if you eat them an hour or even two after they were bought, I think you can still enjoy them in their super soft state like ours. This third box is actually more of my little sister's. Among me, my mom and her, it's my little sister who raves and craves so much for Gavino's Japanese Donuts. I thought it was impossible for someone (light eater) like her to long for donuts. But lo and behold, I always get the "Tara, bili tayo ng Gavino's" line from her. Every day, and at random hours. She loves every chocolate-infused flavor that Gavino's offers. And if there's a Gavino's fans competition, I think my little sis can easily top the list, if not, even win. Now, this box is for my mom. While she appreciates the pon de rings, her heart and palate belongs to the pon de balls which oozes with creamy filling. Among these ball of treats, I've only tried the Red Velvet and the Bavarian. And while both of them are super soft, my pick would be the latter as it stayed true to its flavor. I can't deny that the Red Velvet looks more appetizing, however, I think it still needs more cream cheese. It's very apparent that our family loves Gavino's Japanese Donuts. If you ask us to compare this brand with others, then I'd have to give the award to Gavino's. These Japanese treats aren't as sweet as Krispy Kreme. 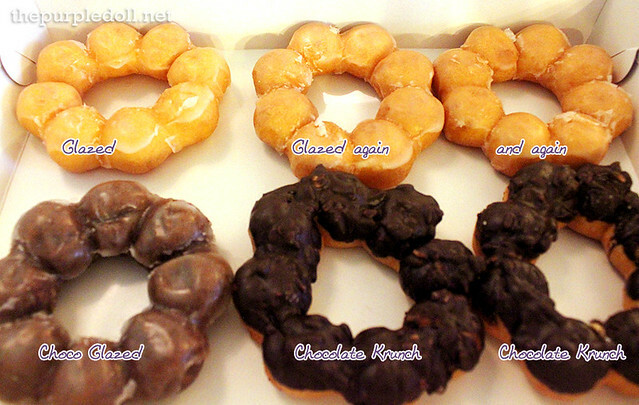 There's also no need to line up for over an hour like at J. Co Donuts. And while Gavino's can still work on developing more flavors to give customers more variety, their great quality, super soft texture and very affordable pricing have won us over, hands down. Flower donuts! Now that's a plus! hehehehe They all look luscious! I wanna bite into the creamy donuts. I can almost taste it! hehehe No wonder your mom and sis both enjoyed the donuts from Gavinos! Mister Donut Japan has this kind of donut as well. Looking forward to taste the green tea glazed and choco glazed! Sumi Go - I will definitely try Gavino's Japanese Donuts. Thanks for blogging about this. Interesting. Probably my first time to see a Japanese donut. This is a must try pastry. My first time too. 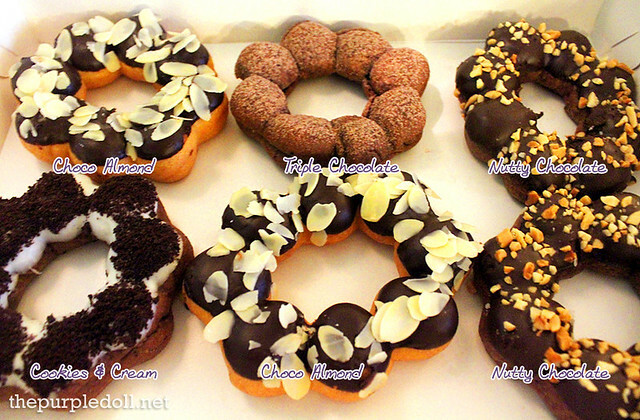 Will definitely try these when I'm around Greenhills. I always see that store whenever I go out for lunch but have yet to try it, after seeing your pics and reading your description maybe I'll finally give it a shot. Another shape of donuts this is great. Doughnuts were a great favorite of my kids. Mmmmmmm... looks so scrumptious! Wanna try (goodluck diet!) Wish they have a branch nearby. The pictures show yumminess all over! I wanna try! I super love this. So yummy! I just wish there's a branch near ortigas. The donuts are yummy, gastronomic! My baby will definitely love this!! Masarap ng tingnan, tiyak yum yum yum din! This made me sing Pon de Replay! This is the first time I heard about this brand. It looks yummy and I like that it's affordable. Looks yummy. 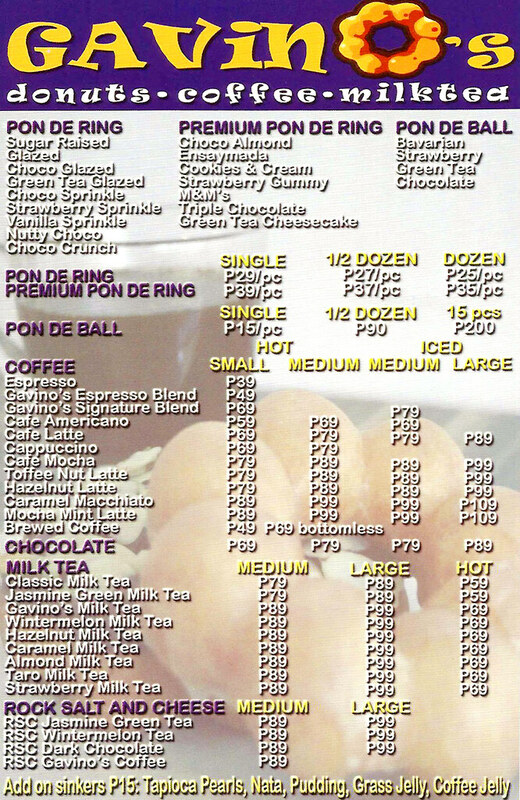 Would like to try the Pons de balls as I like donuts with fillings. hmmm, they look good! The pon de ring donuts are so cute, I'm going to try them out.. I always walk by Gavino's. I've been missing all the yumminess! Will definitely try it this time. my kids love donuts and they gonna love to eat this,cute and looks yummy! too over pricey for a donut but my kids love it! Would love to try this. I'm a big donut lover. This is similar with Mr. Donuts pon de rings! I love Gavino's doughnuts because they're chewy and not too sweet!